Hey there. You know, I love my T shirts. I have plenty of band shirts and video game themes shirts. My Legend of Zelda Triforce tee is one of my favorites, but there are times when I need to look pretty spiffy. It turns out that in the past couple of weeks I had a wedding reception and a baptism celebration to attend to. As most of you know, these are, "look spiffy" events. I have my fair share of button down shirts and a pretty sizable assortment of ties but what I didn't have was that shine... that final touch that would put the whole outfit together. This is where my good friends at Mens Bodega stepped up to the plate. Mens Bodega offers quite a bit of top of the line Men's Fashion accessories and they provided me with their 8 Piece Tie Bar, Tie Clip Set to try out and review. This won't be a very long post since there is only so much you can say about tie clips so let's get into my experience! As mentioned, I received the Mens Bodega 8 Piece set, which is exactly what I needed. You'll find a tie clip for practically any time in your closet. The set comes with 6 silver tie clips and 2 gold ones. Each one has a unique design and finish so this set is definitely made with versatility in mind. This is great since I have a wide array of shirts and ties so I would like to have variety when it comes to picking a tie clip that going to accentuate well. Also, the tie clamps are pretty solid yet gentle and so they will hold your tie in place and not damage them while you're out and about in tie. That is a huge plus for me since I do love to wear ties but I do not like that they seem to flop all over the place. I never bothered with tie clips because I was worried that they would end up ruining my ties so it's great to know that I no longer have to worry about that. 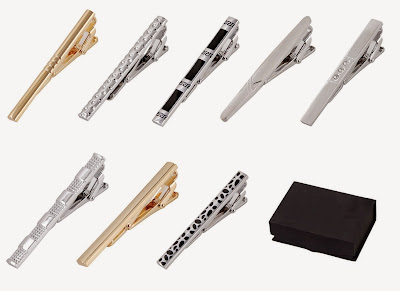 The Mens Bodega 8 Piece Tie Clip Set is comes in a pretty cool looking gift box. It's already good to go as a gift if you plan on handing them out to someone. I actually leave them in the gift box. It's a great place holder for them and I always know exactly where they are when needing them. It's better than having to sift through a jewelry box (or whatever guys use to keep their awesome fashion stuffs, lol) to find the right one. Loving this set up at the moment. Wear this whenever I wear my blue shirt! That's pretty much all you can say about tie clips. This is a great set with a good design variety. Once I find something that works for me, I stick with it and once you have your hands on some of these tie clips from Mens Bodega, you'll wonder why you didn't level up your fashion stats before. You can pick up this great set at Amazon for under $17. Level up those fashion stats, guys! Later!